I thought you might be getting tired of flowers so this week’s photo is of a different variety. 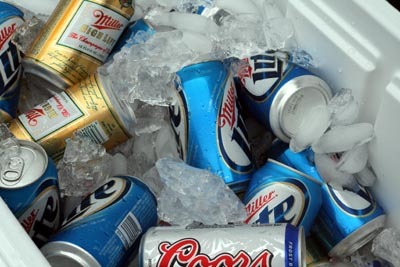 And really, a cooler of ice cold beer at a cook out is just as beautiful as any flower. Am I right? On a hot, dry summer day….nothing could be more beautiful. I don’t even like the taste of beer, but that picture looks really refreshing! Hot Diggity Dog!! Love me an ice cold beer on a hot summer day…count me in! Ahhh, a cook out, sounds wonderful! Wait for me! Could I throw a bottle of vodka in there too? A nice change of pace! I can’t seem to get away from flowers myself. Happy weekend! Good job on capturing both a Native Milwaukee Product, and its new sibling! Enjoy! Mmmm, cold & sudsy!! Have a great weekend… looks like that won’t be a problem. looks like it’s party/band/hang out time this weekend. hahahahaha! That’s good! (but I gotta be honest and say that I really don’t like those beers much… I like the dark and hoppy stuff, but to each her own, eh?). Ooooh, and all that blueberry stuff… yumskers!